Men, Women, Children with hair loss (alopecia). Losing your hair? Want to stop the loss of your thinning hair? 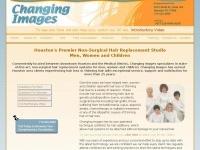 Changing Images, Houston's premier non-surgical hair replacement studio can help. Call 713-523-3500 for a complimentary consultation. The web server used by Changingimages.net is run by Unified Layer and is located in Houston, USA. The server runs exclusively the website Changingimages.net. A Nginx server hosts the websites of Changingimages.net. HTML 4.01 Transitional is used as markup language on the webpages. To analyze the visitors, the websites uses the analysis software Google Analytics. The website does not specify details about the inclusion of its content in search engines. For this reason the content will be included by search engines.